University of Virginia athletes, known for playing their hearts out despite the odds, had their humble beginnings in early nineteenth-century instruction of boxing, fencing and quarterstaff, a short, stout stick used in combat training. 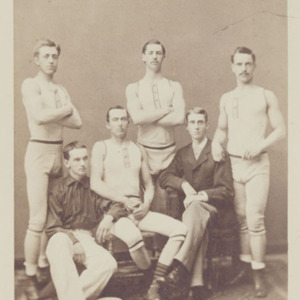 Gymnastics made an appearance in the 1850s and baseball, UVa's first revenue sport, joined the athletic scene in the 1870s. Six years later, football began and quickly gained a foothold, surpassing in popularity the all-American sport of baseball. 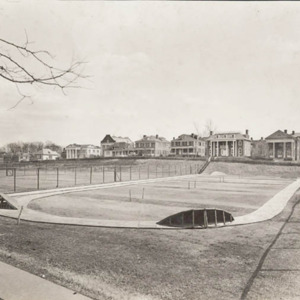 Quickly the "craze for athletics" at the University lead to the creation of the General Athletic Association and the building of sports arenas that continues to this very day. UVa has approximately 606 student athletes participating in sports this year including crew, baseball, basketball, field hockey, football, golf, lacrosse, soccer, softball, swimming, tennis, track and field, and volleyball. Athletics is indeed so popular at the University that the Intramural-Recreational Sports Department itself boasts 8,900 students participating in their 1998 spring, summer and fall programs. 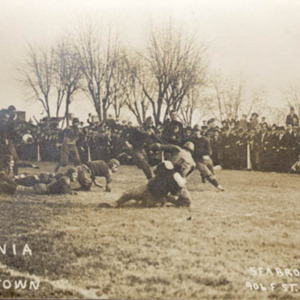 Postcard depicting the Virginia vs. Georgetown game, November 13, 1909. Courtesy of the University of Virginia Alumni Association. Photograph of University of Virginia crew team. 1882. 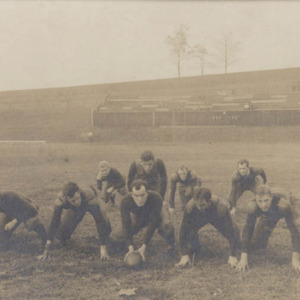 Photograph of University of Virginia "foot ball" team. 1908. Courtesy of the University of Virginia Alumni Association. 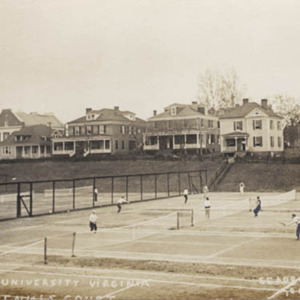 Postcard of tennis courts in Madison Bowl. ca. 1895. 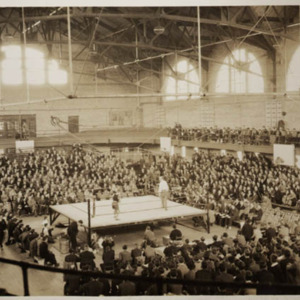 Photograph of boxing tournament in Memorial Gymnasium. No date.